For example, if an investor is targeting a portfolio volatility of 10% and the current VIX is 20, then the investor would weight stocks at x = 10 / 20 = 50% weight. I've actually been working on something similar (actually... almost exactly the same thing), thus I thought it might be helpful to share some thoughts on why this strategy likely leads to a portfolio with an improved Sharpe ratio over time relative to the S&P 500. High levels of market volatility tend to lead to continued high levels of market volatility (at least over short periods of time before mean-reversion does its magic). As the chart below highlights, higher levels of the VIX have largely been the result of high market volatility over the previous month, while high levels of VIX tend to lead to higher levels of market volatility over the next month. Putting the old A = B and B = C, so A = C thought process to work, we get to high levels of historical market volatility leading to high levels of future market volatility. 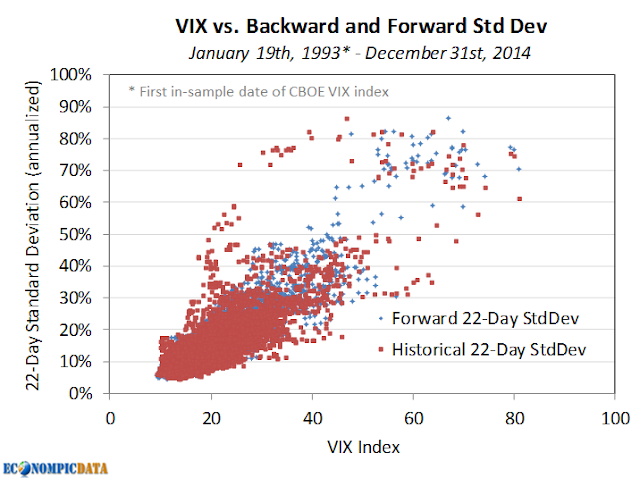 While returns have in fact been a bit higher when volatility is elevated, the relationship has been much weaker than the relationship between historical and forward volatility. As a result, the S&P 500 has had a Sharpe ratio almost 2x higher when the VIX was less than 20 than when it was above 20. 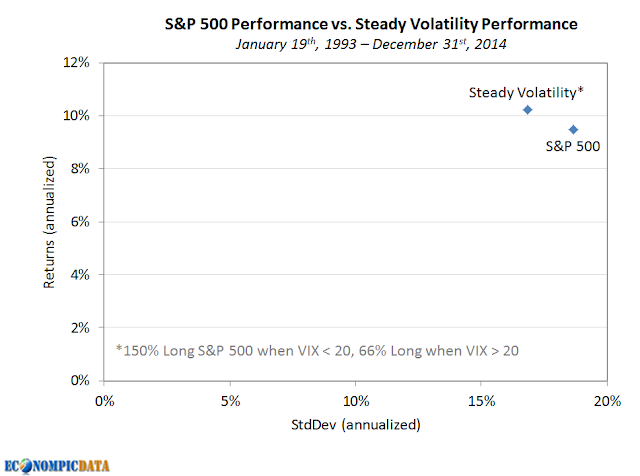 As a reminder, Sharpe ratio is excess performance to cash over standard deviation. The lower denominator when volatility is low more than offsets the impact of slightly lower returns on the Sharpe ratio calculation. 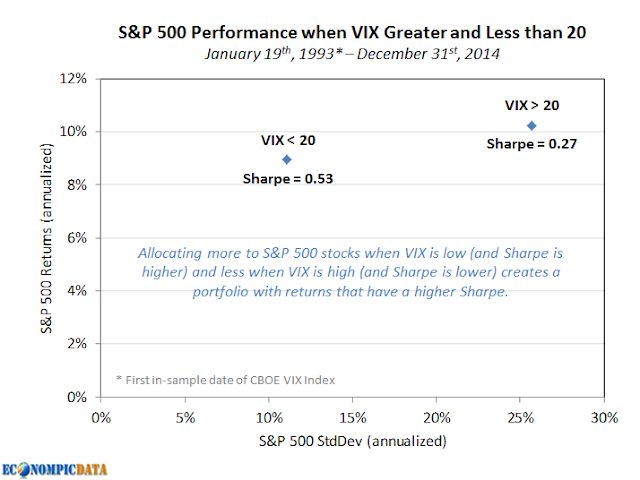 As a result of a higher Sharpe ratio when the VIX is less than 20, an investor could produce higher risk-adjusted returns by allocating more to stocks when the VIX is less than 20 and less when the VIX is above 20. In the example below, stock weights were increased 50% to 150% when the VIX was less than 20 and decreased 50% to 67% when the VIX was above 20 (financed by 3-month t-bills when levered / allocated to 3-month t-bills when unlevered).